Fresh pasta, cheese and fresh ground pepper. I’ve been sitting with this post for weeks now, unable to find words to adequately describe this beautiful simplicity of this dish. While I have many go-to recipes, my favorite dishes are often those with few ingredients that commingle perfectly. 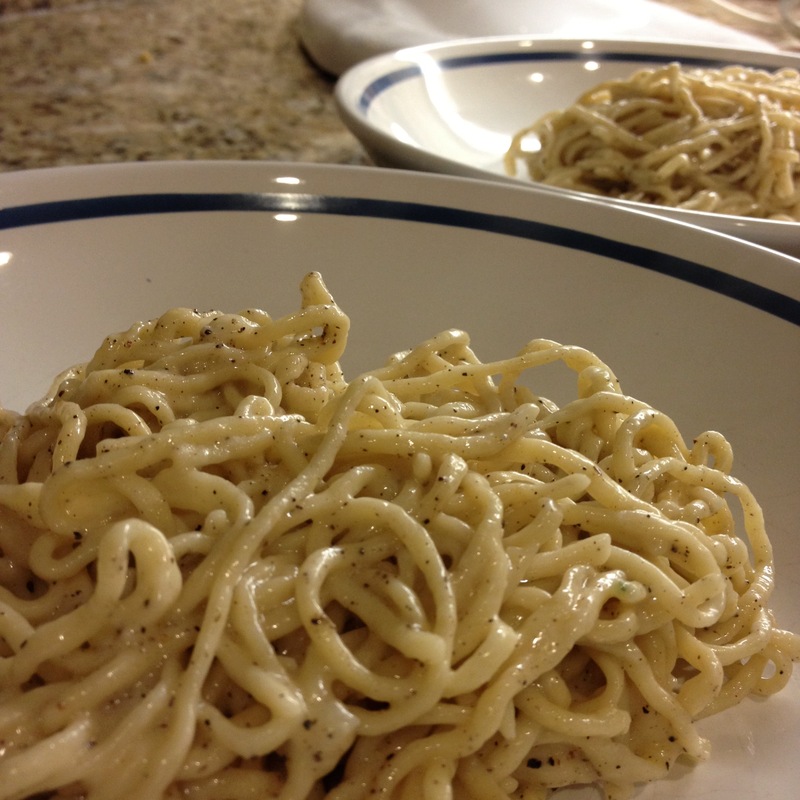 Cacio e pepe is one of those dishes. Fresh pasta, butter and olive oil, generous amounts of black pepper and salty Italian cheeses. Smug in my restraint, I thought: “This will be a beautifully minimalist post that shall represent the serene minimalist nature of the recipe.” How very zen. And thus the spicy, salty, buttery combination was born, a happy accident born out of the weariness of a long day. That’s how I imagine it, anyway. Bring four quarts of salted water to a boil, and cook the pasta for one to two minutes — it should be slightly underdone. Drain, reserving 1 cup of the pasta water. 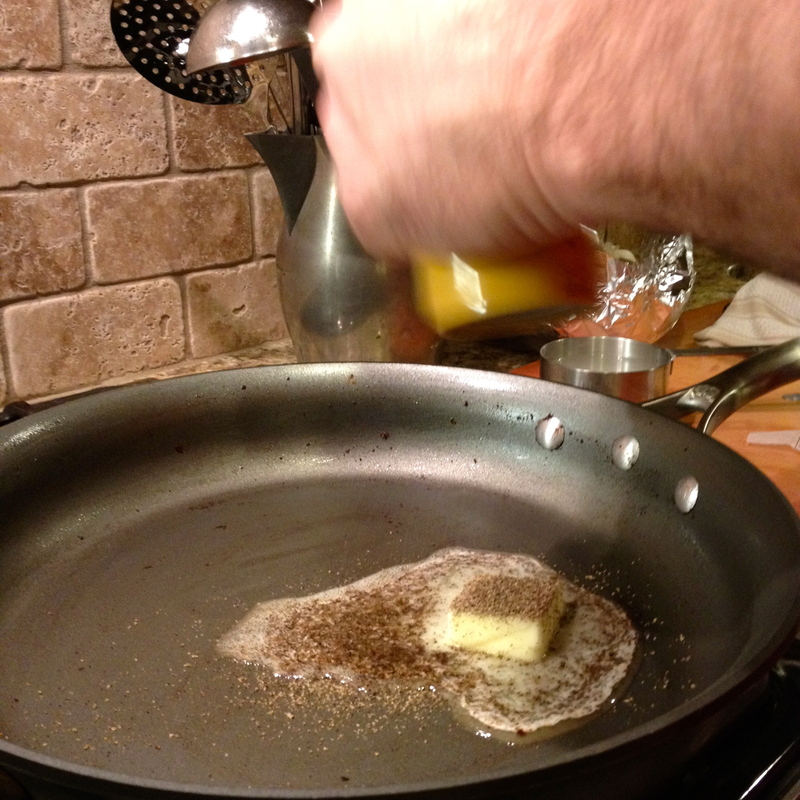 In a large skillet, melt 3 tablespoons of the butter along with the olive oil. Add the pepper, swirling to incorporate. Add 2/3 cup reserved pasta water and bring to a simmer. 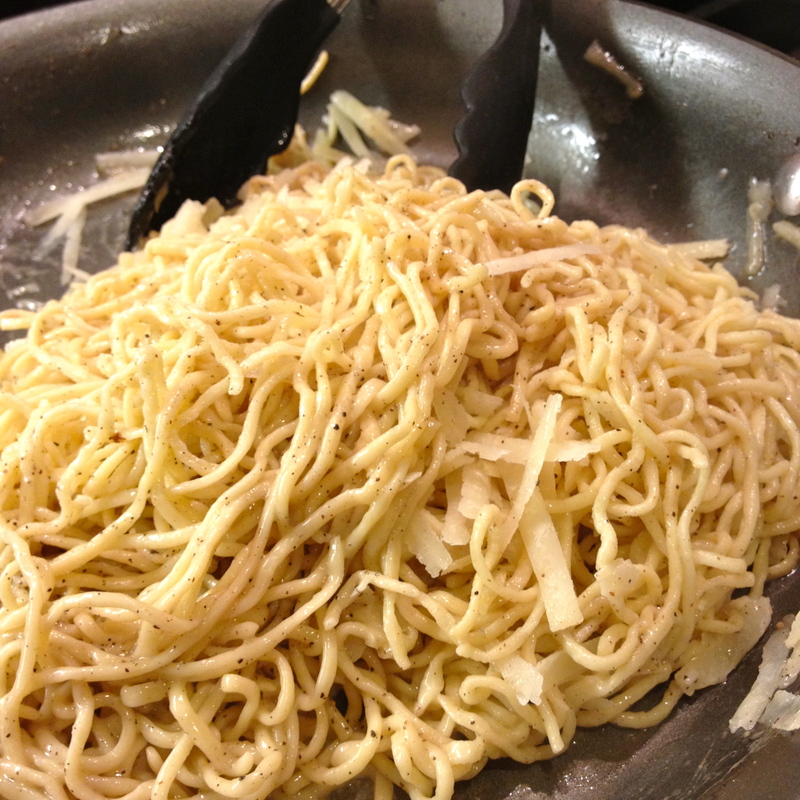 Add the pasta and the remaining butter; using tongs coat the pasta with butter and pepper. Reduce heat and add the Grana Padano, mixing with the pasta until melted. 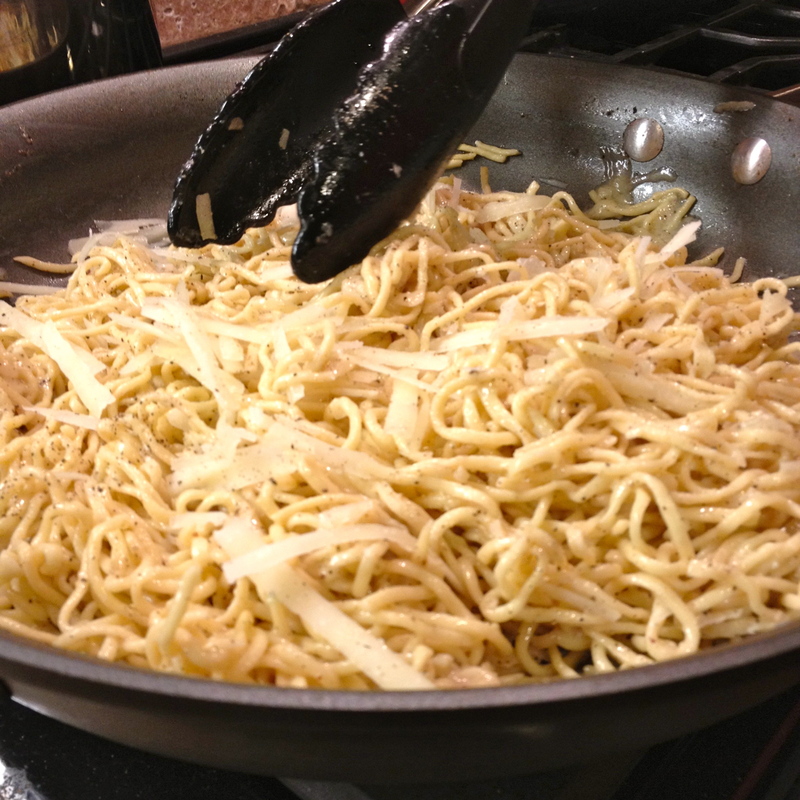 Remove from heat and add the Pecorino, working the cheese into the pasta until it melts and the pasta is evenly coated, and al dente, adding more pasta water if it seems dry. Serve with a medium-bodied Italian red like Langhe Nebbiolo, and toast your beloved and your good fortune at having discovered this dish. And, for the love of god, please don’t bring Mamma into it. 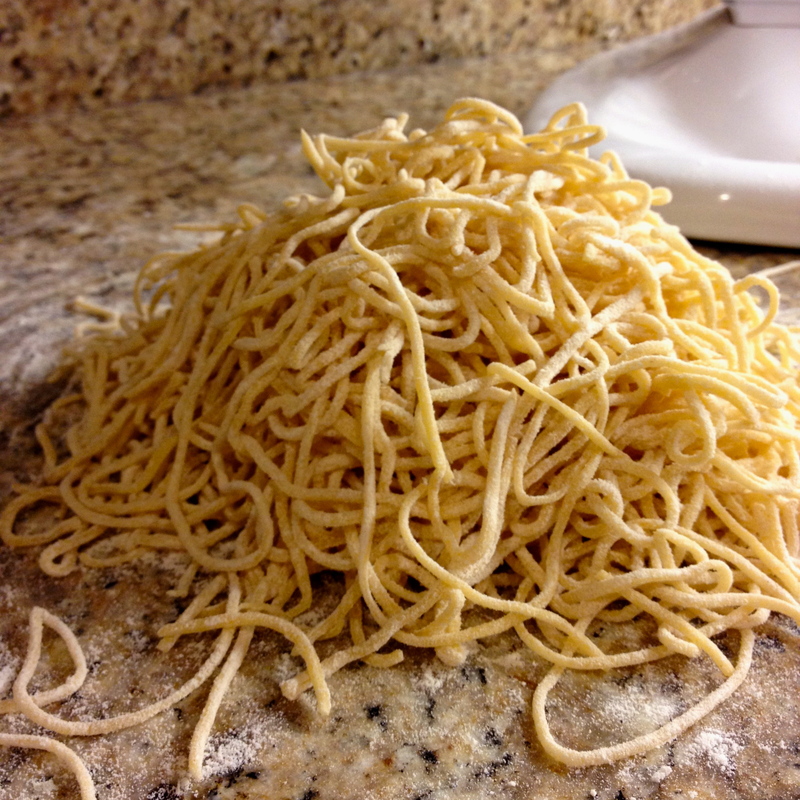 A lovely pile of fresh pasta. Butter, olive oil and pepper. 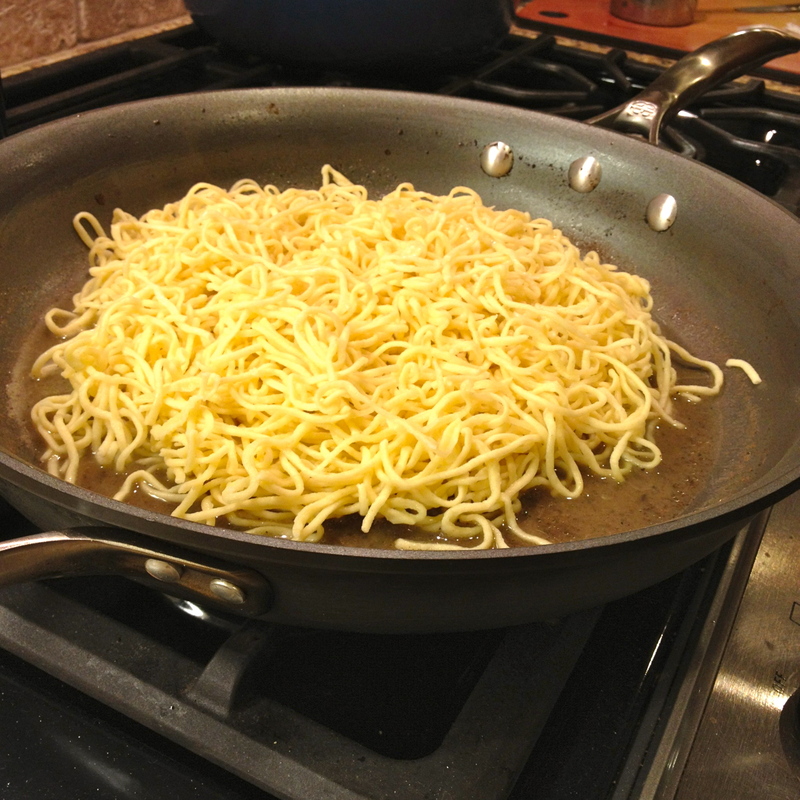 Pasta goes in the pan. Adding the pasta water and cheese. Last bit of cheese, toss, melt and eat. I am still smiling about the grind, grind pepper, you paint a very realistic, colorful picture, (along with the sneeze). The spicy, buttery, salty combo sounds soooo yummy!!! I want some..
It’s delicious, and you’d love it! Thank you for such a fun post. This is one I may have to try.